Land Cover Map 2007 (LCM2007), which was released in July 2011, is our third land cover map in the series (LCM1990, LCM2000, LCM2007 and LCM2015). It is derived from satellite images and digital cartography and gives land cover information for the entire UK. Land cover is based on UK Biodiversity Action Plan Broad Habitats. LCM2007 builds upon the successes of the parcel-based mapping of LCM2000 and employs similar but enhanced classification techniques. The principal difference between LCM2007 and LCM2000 is the source of land cover parcels. LCM2007 parcels come from generalised digital cartography refined with image segments, whereas LCM2000 uses only image segments. Deriving objects from digital cartography is advantageous. Cartographic boundaries accurately delineate real-world land cover objects (e.g. lakes, fields, settlements, industrial areas, semi-natural areas). This improves the spatial accuracy of LCM2007 over LCM2000. The accurate delineation of real-world objects also helps to clarify the spectral properties of the land surface and therefore also improves thematic accuracy. Please see the LCM2015 webpage and dataset documentation for the differences between LCM2007 and LCM2015. Land Cover Map 2007 is available in different formats to suit the requirements of various users. The most detailed product is vector data, where each polygon represents a parcel of land and has attributes describing land cover and metadata describing how this information was derived (see Table 1). Scale: Minimum Mappable Unit for land cover parcels: 0.5ha. Supply Format: ESRI® Shapefile format for small areas of data; Geodatabase format for the whole of Great Britain. Five raster products simplify this information. 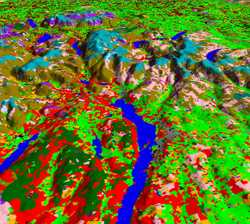 A 25x25m raster gives the most likely Broad Habitat for each pixel. Four freely available 1x1km raster products summarise the 25x25m raster. Metadata for the LCM2007 raster formats are available in Table 3 and Table 4. Request Land Cover Map 2007 from our Data Licensing Team using the form below or visit the CEH Environmental Information Platform for links to the various LCM2007 datasets. For Academic Research/Education only, all CEH's Land Cover Map datasets are available for free via EDINA, specifically the Environment section, and via the JISC Geospatial Data Service. 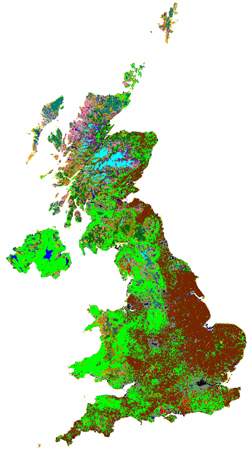 Contact datalicensing@ceh.ac.uk for further information on Land Cover Map. You can also view the LCM2007 launch webinar below.